Are you ever in a new area and want to see what is hopping? Instead of looking for events on Facebook to crash, you can actually see what people are doing! With three main features, Bivid is giving you up-to-date access on what strangers around you are doing as well as your friends and celebrities you are following. With a 24 hour lifespan for the content it won’t disappear in 10 seconds and you can actually use the information practically. 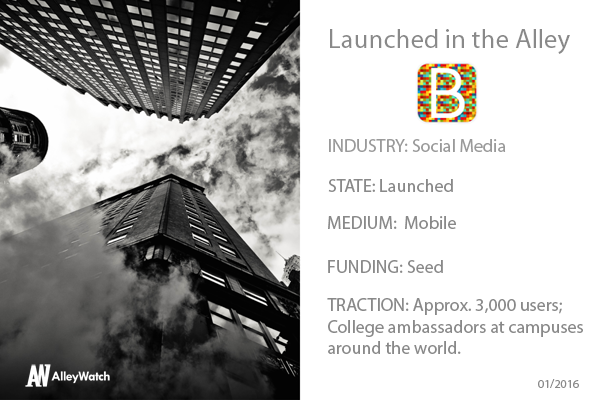 Already blowing up at universities, Bivid is changing the social scene and could be expanding very soon. Cofounder and CEO Dean Glas talk about the company with AlleyWatch and give us the 411 on how they are shaking up the mobile experience. Bivid is a first-of-its-kind app that centers around users sharing moments with their communities. At its core, the app serves as a collective and interactive photo and video album that documents the human experience, both locally and internationally. The app even incorporates a taste of Snapchat: to encourage fresh, real-time feeds that reflect current news and events, posts on Bivid last for only 24 hours. There are no other apps on the market that do exactly what Bivid does. The app focuses on the daily experience, instead of a weekly or monthly user experience with a long-term content shelf life. Because of the 24-hour content lifecycle, Bivid enables content to be fresh. Additionally, it empowers users to be heard and seen by the world, while at the same time protected, because posts disappear after 24 hours. Ever wondered whether the concert at Madison Square Garden is still rockin’, or whether that poetry slam downtown is worth stopping in for? Imagine finding yourself at Coachella, and being able to see where your friends are, meet new people and virtually attend every concert at once. On Bivid, you can see what others are posting about the event, and you can find it right now, when you need to know. Bivid lets users see all posts from users around them and not miss a moment. While Bivid has appeal for users of all generations, we’ve found that users have exploded on college campuses. Our user base has more than doubled each month since we became available on the App Store in September, and that’s no surprise. With Yik Yak mired in controversy, we believe that because Bivid users aren’t anonymous, people are taking to our app as an alternative to the big horned animal. We wanted Bivid to be a safe and positive online community, and so far, this approach has been very successful. The market for location-based apps with non-anonymous users is just beginning, and we’re excited to be at the forefront. Bivid has raised seed funding, and we’re working on a Series A, but for now we’re mainly focused on growing our user base. Once we’ve reached a critical mass and have a moment to ourselves, we plan on turning our attention to monetization aspects — which we guarantee won’t affect the integrity of our seamless platform. My co-founder Mendy Raskin and I met in college in New York City nearly three years ago. We had similar goals and ambitions in life, and early on, we realized that neither of us wanted to work for anyone else. We tried many times to begin new endeavors, and bounced hundreds of ideas around, but nothing resonated with us until we conceived Bivid. After many all-nighters, the full concept of Bivid was born. Then we did something that everyone had warned us not to do: we dropped out of college. We knew school wasn’t going anywhere for us, but Bivid was. We spent all our money creating designs and a prototype, which ultimately led to us raising a round of seed funding. In the vernacular, bivid means “to work and come together,” and we feel that the app encapsulates this value. Couldn’t the core functionality of your platform’s offering be easily replicated by a larger social network that has a critical mass? There are no apps on the market that combine all the best of Bivid’s features: short content lifecycles, no anonymity and location-based technology. Plus, Bivid is fun! Users can add custom filters, draw over their posts and even change their text with special fonts. While it’s true that apps like Snapchat currently have larger user bases, we have structured our platform for long-term growth and stability from day one, and are positioned to create strong headwinds with our wildly creative product pipeline in the coming months and years. Lots! We are preparing to release an Android version of the app and to add more functionalities to the platform. We’re also knee-deep in working to raise a Series A funding round, which we’re expecting to close within the next couple months. Of course, scaling our user base is one of our main priorities, and we have a college “ambassador” program with reps on campuses around the world. We’re looking to grow that program as well to continue gaining new users. For our longer-term vision, we plan to partner with restaurants and event venues to promote specific sports games, concerts and locations, showing how powerful the platform will be for socializing content and occasions. Almost all things take longer than expected. You can schedule and you can plan, but hurdles and obstacles always present themselves — and when least expected. Based on this experience, I want Bivid to be a place where we plan and anticipate roadblocks as much as we can, so that when challenges do arise, we’re best equipped to handle them. As we expand, we’ll need to keep our team lean, so that we can work together and create the best app possible while we scale efficiently. This approach is how great companies are born. Since I was a young boy, I always tried to emulate the many entrepreneurial heroes of the world, and I was most interested and inspired by the people who have built massive companies from scratch. I knew that if they could do it, so could I. But rather than limit myself to a single New Yorker, the people I follow closely today are icons like Richard Branson, John Paul Dejoria, Mark Cuban, Jan Koum, Howard Schultz, Larry Ellison…and the list goes on and on. I would spend hours each day reading and watching every movement of these figures, just to learn anything about them I could. One day, meeting one of them and giving them a Bivid demo would make my life complete. Mendy and I met in college here, and Silicon Alley is a great location for tech companies. With the technology, the culture and the resources, along with the infinite number of college campuses, New York is a great location to begin our new venture. We also love how close- knitted the city is, and feel it’s the perfect place to trial our location-based technology. Additionally, I think that in some ways, staying in your comfort zone is important when embarking on a life-altering chapter. You need a strong support system, and being surrounded by ambitious people who can continuously push us and challenge us was incredibly important. However, when the time is right, I can imagine Bivid opening its headquarters on the West Coast. New York City winters are brutal! I’m a big foodie and love trying new restaurants! My favorite dishes are steak, sushi, and obviously NYC pizza. One of my favorite restaurants is Nobu, which has some of the best fish and sushi dishes. I definitely recommend the Crispy Rice, Yellow Tail, and Black Cod. Nobu has locations around the world, and I was surprised to see their storefront when I was in Hawaii three weeks ago! Next What Uses Less Energy: An iPhone or a Fridge?